Successful ubiquitous induction of Cre activity after tamoxifen administration in all tissues analyzed. Efficiency of deletion varies between different organs and different loxP flanked (floxed) target genes but usually exceeds 70%, except in the brain were deletion efficiency is lower. Non-induced background recombination is minimal in heterozygous carriers of CreERT2. For the generation of the experimental colony which will be used for induction of deletion of a floxed target gene, it is mandatory to always maintain the CreER in a heterozygous state, to diminish noninduced background recombination and possible side effects. In addition, background recombination may be enhanced, if embryos are exposed to CreER(T2) carrying mothers. It is therefore strongly recommended to breed CreER(T2) negative females which are heterozygous or homozygous for the floxed allele to CreER(T2) positive males which are wild type, heterozygous, or homozygous for the floxed allele. To avoid unwanted deletion of the floxed allele, it is strongly recommended to monitor the status of the floxed allele in the offspring from these breedings and to maintain the floxed parental line also in the absence of CreER(T2). When proper induction conditions are used, side effects are only seen in tamoxifen induced homozygous CreERT2 mice. Side effects include illness and lethality of tamoxifen induced animals, which may occur between 5 and 15 days after induction. Symptoms include: reduced mobility, weight loss, severe sustained diarrhea, and death. To avoid side effects, homozygous CreERT2 mice should not be induced. Taconic recommends a starting dose of 4.55 mg per dose for mice weighing 23 grams and 3 mg per dose for mice weighing 23 grams. Dosing should be by oral gavage. If side effects are seen, dose reduction should be pursued with monitoring of deletion of the target gene. Taconic recommends a pilot study with the proper experimental and control cohorts to optimize the induction protocol and to monitor the deletion of the floxed allele. Such pilots can be performed by Taconic. The CreERT2 mouse was developed by Artemis Pharmaceuticals (now Taconic). The model was created by a targeted mutation knock in of high affinity CreERT2 (cre/ESR1) into the Gt(ROSA)26 locus on chromosome 6 in C57BL/6NTac ES cells. Cre/ESR1 was generated by fusion of the Cre (bacteriophage P1) gene to the high affinity human estrogen receptor gene ESR1. Cre/ESR1 is expressed under the control of the Gt(ROSA)26Sor gene. Additional sequence elements are adenovirus major late transcript splice acceptor sequence from the intron 1/ exon2 boundary situated 5´ and FLP recombinase target (FRT) sequences (Saccharomyces cerevisiae) situated 3´ of CreER. The colony is maintained by incrossing homozygous mice. Seibler J, Zevnik B, Küter-Luks B, Andreas S, Kern H, Hennek T, Rode A, Hiemann C, Faust N, Kauselmann G, Schoor M, Jaenisch R, Rajewsky K, Kühn R, Schwenk F. (2003) Rapid generation of inducible mouse mutants. Nucleic Acids Res 31(4):e12. Once the agreement is executed, you may order mice to crossbreed. A 20% reduction of the CreERT2 Research Crossbreeding Agreement fees is offered if breeding is done at Taconic. 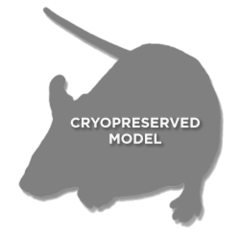 License for performing inducible deletion: For-profit customers who wish to perform inducible deletion using the CreERT2 mouse line (e.g., Tamoxifen induction based deletion) will need a license from Le Centre Européen de Recherche en Biologie et en Médecine ("CERBM") if they are located in a country in which a patent has been granted to CERBM. We are happy to provide you with contact information to help with facilitating this process. IgG1 B cell receptor signaling is inhibited by CD22 and promotes the development of B cells whose survival is less dependent on Ig alpha/beta.